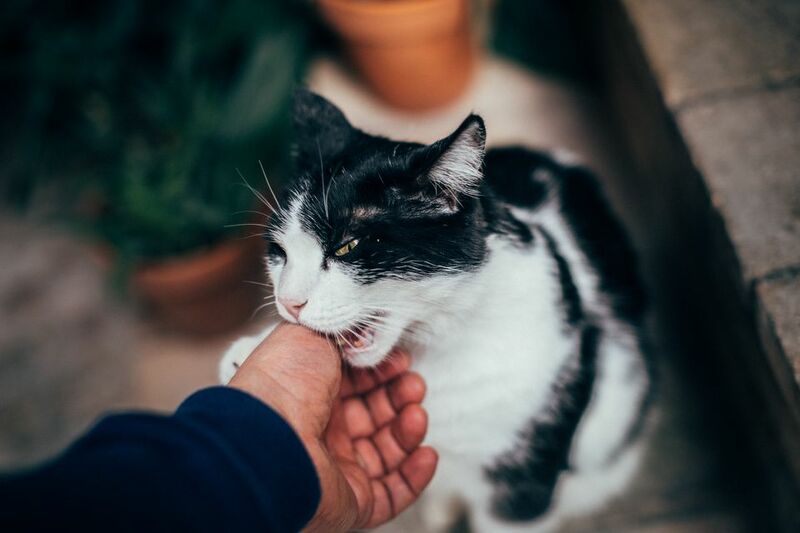 For people who live with animals or interact with them in any way, it is important to understand the potential danger of animal bites and scratches. Any injury received from an animal must receive proper wound care to prevent infection. You should also see your own doctor if the injury is severe or showing signs of infection. Animals, even well-trained ones, can be unpredictable. Exercise caution when dealing with animals that are stressed, frightened or injured. A pet may exhibit fractious behavior that is not characteristic of "normal" behavior when he is ill, hurt or perceives a threat. It's also common for people to be bitten when breaking up a fight between animals. It's difficult to restrain yourself at the moment, but remember that you should not put yourself in the middle of a dog fight. Cat fights can be equally vicious and should be approached with caution as well. Wild animals should not be handled when sick or injured. The best option for wild animals is to call your local animal control or game management office for assistance. People often minimize injuries sustained from an animal because they are embarrassed or frustrated by getting bit while helping the animal. The potential for human injury is the main reason that many veterinarians do not allow owners to restrain their pets for procedures. At first glance, some injuries may not look like much damage has been done. A puncture wound (without tearing of the flesh around it) is usually a small hole that closes quickly. This can be deceiving, as any bacteria and damage may be trapped below the surface, which can lead to infection. In other instances, diseases may be spread by the bite or scratch. Two zoonotic diseases that we think of most often are rabies and cat-scratch disease (Bartonella). According to the U.S. Centers for Disease Control and Prevention (CDC), symptoms from these can take days or longer to appear. The CDC also notes that there are as many as 16 diseases that can be transmitted from cats to humans and 21 potential diseases that dogs can pass on. This potential is one of the primary arguments for ensuring your pets are up to date on all their vaccinations and receive regular vet check-ups. If you don't know the animal or have a medical condition that compromises your immune system, the case for receiving medical care is even greater and you should see a doctor right away. The potential transmitted infections do not take into account possible problems from the wound itself. Even a bite or scratch from a pet who is perfectly healthy can result in an infection from other sources if it's not taken care of properly. All wounds should be washed immediately with soap and water. According to John Hopkins Medicine, you should wash the wound under a faucet for a minimum of five minutes. It's also not advised to scrub it because this could bruise the surrounding tissue. Once clean and patted dry, apply an antiseptic lotion or cream and cover it with a bandage. That said, all bite wounds should be taken seriously and checked by a doctor. It is also a good idea to see your physician or go to an urgent care facility for the best chances of quick and uneventful healing of any bite or scratch. If not treated promptly, the signs of infection include redness or discoloration, swelling, pain, a warm-to-touch feeling, and discharge. You should also monitor the victim for any flu-like symptoms such as fever, headache, or swollen glands. Please note that this article has been provided for informational purposes only. If your pet is showing any signs of illness, please consult a veterinarian as quickly as possible. If you have been bitten or scratched by any animal, seek treatment from your medical doctor. Centers for Disease Control and Prevention. Healthy Pets Healthy People: Cats and Dogs. 2016. John Hopkins University. Treatment for Dog and Cat Bites and Scratches. 2017.